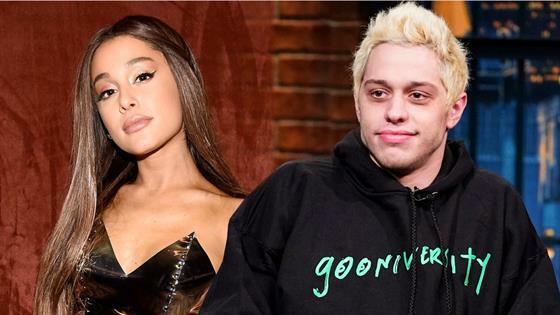 Ariana Grande was "not amused" by Pete Davidson's Saturday Night Live joke, seemingly aimed at their breakup. The 25-year-old "No Tears Left to Cry" singer put the 24-year-old SNL comedian on blast on Thursday, shortly after a promo for this weekend's sketch comedy show was released. In the teaser, Davidson appeared alongside celeb host Jonah Hill and musical guest Maggie Rogers, who will hit the SNL stage on Saturday. "Hey Maggie, I'm Pete," Davidson said in the promo. "You wanna get married?" After she declined his offer, he responded, "0 for three." After seeing the video, Grande took to Twitter to share her thoughts on Davidson's joke. "For somebody who claims to hate relevancy [you] sure love clinging to it huh," Grande tweeted, before adding, "Thank [you], next." "She wasn't amused by Pete's jokes at all," a source tells E! News about Ariana's reaction. "They made an agreement that they would not address their relationship or discuss it after they split up. He violated that agreement and it really hurt her. She knew he would see her tweet." "Pete is having a hard time with the breakup and making jokes his way of dealing with it," the insider continues. "Ariana hopes that he will have enough respect to not do it again." But another source counters, "Pete never said her name in the joke. It wasn't a joke about her, it was self-deprecating. It's not true he violated any agreement." On Friday, Ariana returned to Twitter to send out what appeared to be lyrics to a new song. "cause look what i found .... ain't no need for searching and for that i say.... thank u, next," she began her series of tweets. "got so much love..... got so much patience..... i've learnt from the pain .... and turnt out amazin.... say i've loved and i've lost..... but that's not what i see cause look what i got.... look what u taught me." She then added, "and for that i say ....... thank u, next." It's been a very difficult time for Grande, who is still mourning the death of her ex-boyfriend Mac Miller, who passed away in September.